The coral reef is an underwater community that has the effectual ability to interact with various species to create a natural balance. This rock like construction is mainly limestone comprised from a grouped combination of the calcium carbonate. This is produced by the coral polyps in order to hide away their fragile essence in a shell. In addition, dwell the vibrant sponges, sea fans and starfish along side with over a thousand species of sea plants and marine animals. The Florida Keys is home to the largest active coral barrier reef in the United States. Key West Scuba Diving trip offers a great way to encounter the exceptional beauty of the coral reefs. Their guiding knowledge of the coral reefs can assist the beginner and safely preserve its living inhabitants. The coral reef can be tragically altered by the slightest touch of a finger or flipper, for the coral has no resistance to infections. There are three basic pieces of equipment needed to engage in Key West snorkeling such as a water tight fitting mask, snorkel and a pair of comfy fitting snorkel fins. The large amount of salt concentration flowing in the ocean water and around the coral reefs encourages the sense of floating. In addition, the utilization of the fins does give the ease toward swiftly moving through the water. Therefore it is not necessary to provide much effect in discovering the wonders of the coral reefs. Just remember to float toward the top of the water so that the snorkel stays above the water in order to breath. The coral reefs make a difference to a multitude of marine life living in depths of this warm, shallow and restless clear water. There are many mutual efficient benefits given to one another in this oceanic life. For instance, inside the vase like shell lives the coral polyps and within its tissue contains the one celled algae zooxanthellae. The sunlight from the clear water causes the zooxanthellae to produce oxygen that provides food to the coral polyps. In return, the coral polyps' releases carbon dioxide that gives nutrients to the zooxanthellae and creates the limestone skeleton shell. Jellyfish also provide food and shelter to certain fish that are impervious to their sting. By living under the tentacles of the jellyfish, these fish act as bait in order for the jellyfish to capture other fish. The coral reef also provides a highly important function in sustaining life for people as well. The fish, clams, mussels, and other crustaceans help to feed millions of people year round. The sell of the unique species of fish caught along the coral reef also brings income to families in need. 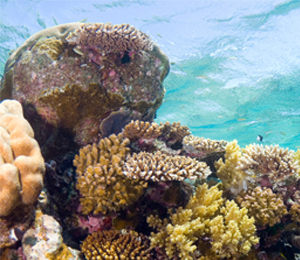 The beauty of the coral reefs contributes to the income for individuals by monitoring safe Key West snorkeling tours. For hundreds of years the coral reefs have protected the shore from the strong currents, for it slows down the movement of ocean water. However the industrialization of people living near the coast has altered the ocean water. The pollution surrounding the coral reefs has created an over growth of algae. The coral reefs need to have clear water to survive, for the sunlight brings nutrients to their environment. Without the coral reef there would be no food source, shelter, protection for a multitude of species of plants, animals and people. As long as our reefs are protected then future generations can enjoy Key West Scuba Diving.